Product Photography is one of the primary photography categories that a corporate sector will most likely be offering. To master Product Photography, you would need to develop your work in a controlled studio environment. In today’s online market, Product Photography will help you work through the online and offline advertising channels of your corporate clients. The quality of product photography will ensure the marketability of the products that you are shooting images of. One of the essential elements you would need for efficient product photography is a Shooting Table for your product photography. Let us check out a few best Shooting Tables for product photography in the following paragraphs. Product Photography is what you would use to showcase the products attractively so that the clients would be enticed to buy your products. You, as a photographer, would make use of specific techniques to create best product portfolios. Product Photography forms part of an efficient advertising campaign. It can be utilized for a wide range of advertising platforms including brochures, magazines, billboards, and websites. An essential tool you would need is the Shooting Table for your Product Photography requirements. 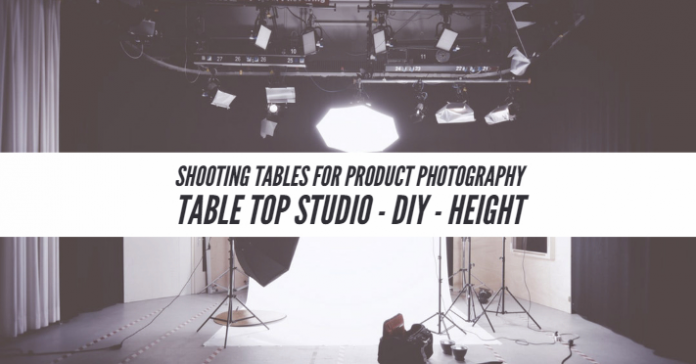 A Shooting table is a perfect lighting table that would help you illuminate the product at all levels. In fact, it would be quite ideal equipment in Product Photography while shooting smaller or medium-sized products. You should get a bright white background when you take photos of your products. Of course, a shooting table can be created within minutes if you are indeed an expert. However, if you are not, and looking for the best Shooting Table for your needs – here are our best picks for your needs. In many cases, the shooting tables come as part of a package that includes several other components needed for product photography. Let’s check them out! It should be an ideal option for all your needs in product photography. 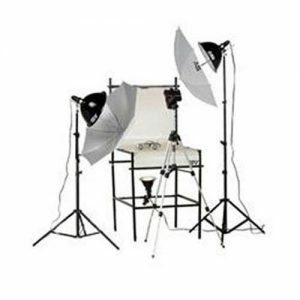 The product comes complete with all the required components for your product shooting needs. The package comes replete with shooting table, lights complete with dimmers, and mounting arms. You can get almost all types of lightings included dramatic lighting and high essential lighting. The product comes with the Q250 light head that would provide excellent illumination. You may also get diffusion agents for a softer tone. Looks inspiring enough? Check them out on Amazon. In case if you are looking for an affordable option and just the shooting table for your needs? Well, the Flashpoint Shooting Table with Plexi Glass can be your excellent choice. The bright white background required by your product images can be quite comfortable and straightforward with the shooting table. It comes under the classic transit table that veteran photographers use. It should be your ideal solution for shooting the transparent items like crystal and glassware. It can either be lit from the front to remove shadows or can be backlit for spotlighting the products. You have access to a three-way translucency that can provide a shadow-free result. Foldable design makes it extremely portable. If you find it a practical solution for your needs, you may get more information from Amazon. If you are into still product portfolio, the JTL Still Product Table can be your best option for your needs. The highly portable design is what would make it one of the excellent choices. It features a milky white surface that would provide an excellent background for all your needs. The fabric used is made of durable nylon and thus can take loads up to 18 pounds. Assembly and dismantling of your shooting table are quite simple and easy to follow. You can use lighting from any side or even from beneath. If those features impress you enough, you can check the more features at Amazon. Economical, durable and space saving – that is precisely what we can term Smith-Victor TST-P2 as. 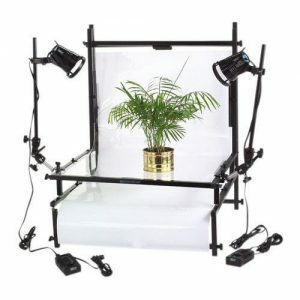 The shooting Table is available as part of a kit and comes with all the essential elements like lights and filters. It offers you a one-stop solution for all your product photography requirements. The shooting table kit comes with one ST24 Opaque Base Module and CM24 Clear Module. You can use them together or separately. The load capacity of the table is 30 pounds. The package comes with two 12″ and one 5″ tungsten flashlights. You have two white umbrellas as part of the kit. If the features have made you opt for the product, you may consider checking it out at Amazon. The shooting table kit in its utter simplicity. That should be what we treat the Kaiser 205906 Studio-Out-of-the-Box kit as. 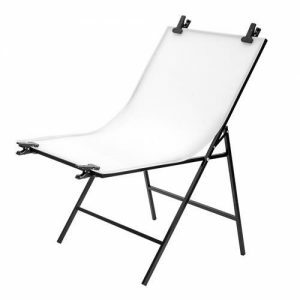 An affordable shooting table with smooth controls, it is one of the accessible tools for your product photography. It comes with a trapeze that helps to position the camera at any position. The shooting table is positioned on the pivot table. You can also lock it for any vertical shooting position as well. You can also use it with smartphone cameras – thanks to the rubberized clamp for the purpose. 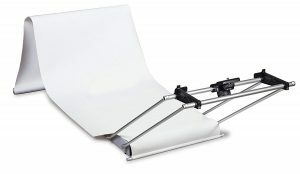 The Shooting Table is one of the excellent options for the product photography. However, choosing one may not be an easier task. In fact, we would suggest you opt for the complete kit as that would offer you a perfect option for your needs. Moreover, the additional items included in the package would be entirely compatible with the shooting table, and as such, you would not need to search for the components. What would you think of the products we have featured above as long as your product photography requirements are concerned? If you have used any of them, we will welcome your views, opinions, and experiences with the shooting tables featured in this compilation.